MUSEO DE FRIDA KAHLO: "DIEGO Y YO"
IS A WORK OF 1949, IS CURRENTLY IN EXHIBITION AT THE COLLECTION OF MARY-ANN MARTIN / FINE ARTS IN NEW YORK. 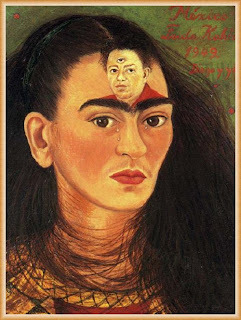 DURING HIS MARRIAGE WITH DIEGO RIVERA, THEY HAD MANY PROBLEMS BECAUSE HE WANTED TO MARRY WITH A MOVIE STAR, BUT FINALLY HE STAYED WITH FRIDA. THE PAINTING CAME FROM THIS EXPERIENCE.